For my first card, I created a heat embossed sentiment background with the All Occasion Sentiments stamp set and then layered my focal area on top. 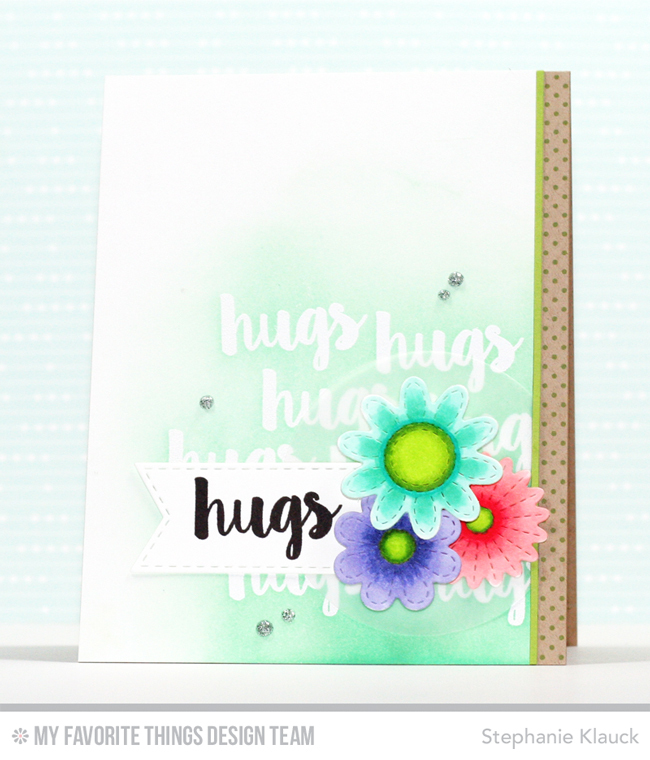 I stamped the word 'Hugs' repeatedly with the Versamark ink that comes in the kit and than I added the white heat embossing powder on top. Once I had the words heat set, I added Cracked Pistachio distress ink over top with an ink blending tool so the white embossed words would show through. I diecut some of the flowers from white embossing powder and coloured them in with Copic markers. I then added them over the stamped sentiment banner using foam adhesive on a couple for some added dimension. You can see the card created from start to finish on the MFT YT channel for this week's MFTv episode. Such a gorgeous card! I am totally in love with the new kit! Wow so different and stunning too thanks fir sharing. Love how you contrasted the white "hugs" in the background with the black sentiment "Hugs"
This card is gorgeous I love the everything about it. So pretty! Can't wait to get this kit! Oh so pretty. Lovely use of shading. Thanks for the hugs. So pretty! Love the shaded flowers. Love all the hugs and the cracked pistachio background with the polka dots peeking out. Very pretty card. Such a lovely card! The Polka Dots pop with the background and the flowers are devine.